Abarth 595C in Podium Blue. Some cars are designed to carry lots of people and gear. Some are designed to ford every stream, if not climb every mountain. Others are built to tow heavy things. This car, the Abarth 565C, is designed with one thing in mind: driving pleasure and pure fun. This isn’t a car that’s about having all the latest gadgets. It’s not about looking aggressive and intimidating others. It’s about you, the road and the machine. The Abarth 565C is a happy little two-door convertible with a soft-top roof and a sense of humour. It’s got personality and it’s anything but bland. It’s got the looks to put a smile on your face, with plenty of cute quirkiness. The styling of the old Fiat 500 is still there for those to see it, but it’s been given a modern edge in the form of body-coloured bumpers and wing mirrors, as well as chrome handles. It’s curvy and bug-eyed – in fact, the daytime running lights, the fog lights and the headlights are all appealingly rounded. The twin exhausts, the badging, the 16-inch alloy wheels, the roof spoiler (yes, on a convertible) and the deep air intakes are the details that save the overall styling from becoming too cartoonish. The paint options for the Abarth 565C also highlight the sophisticated naivety of the styling, with bold primary colours (Abarth Red, Modena Yellow and Podium Blue) being presented as options alongside four shades of grey, plus black and white. The interior of the Abarth 565C, however, is pure sports, starting with the black cloth-trimmed sports seats in the front (and seating for four in total if you want a few more passengers along for the ride). Sports pedals and the flat-bottomed multifunction steering wheel also continue the sporty styling – and you can set the 7-inch TFT instrument display cluster to a sports configuration if you’re in the mood for it, which you indicate by adjusting the driving mode to Sports via the push-button selector. The Abarth 565C is set up for a driver who likes to enjoy him/herself, so there aren’t heaps of driver aids and convenience features. There are enough to make sure that everybody’s comfortable, but the attitude seems to be that if you’re in the Abarth 565C, you’re here for the fun of the ride, and if you want storage space and somewhere to put food, then you might as well stay home, and if you would rather have something or someone else doing everything for you instead of doing your driving, you may as well take the bus or ride in one of the passenger seats. The only real driver assistance you get in the Abarth 565C comes in the form of rear parking sensors, although some people might count the electronic stability control as a driver aid. You get manual climate control, a good sound system that talks to your smartphone via Bluetooth and has a 5-inch display panel (and has controls on the leather wrapped steering wheel), a 12-V power socket and navigation as standard, but that’s about it. Obviously, when you can drive with the top down, the ride in itself is entertainment enough. For the driver, the Abarth 565C certainly is entertaining to drive, as it’s all set up with 5-speed manual transmission (or Dualogic automatic with paddle shifters). The front wheels (which are the driving wheels) are set with adaptive suspension with frequency selective damping, so you can really get a feel for the road that’s comfortable and responsive. Powerful brakes – with snazzy red callipers – are there to rein everything in quickly and safely. And those powerful brakes do need to be there. The Abarth 565C might look like a cute convertible, but it’s got a surprise hidden underneath the curvy little bonnet in the form of a 1.4-litre turbo unit with 16 valves, inline four configuration and multiport fuel injection. This is capable of delivering 107 kW of power and a decent 206 Nm of torque at 3000 rpm. 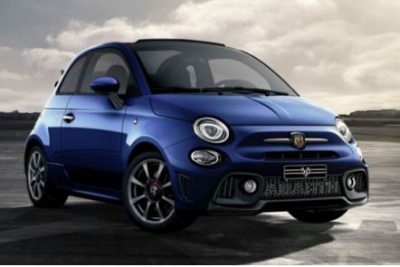 These power and torque figures, in combination with the diminutive size of the Abarth 565C, add up to a 0–110 km/h time of 7.8 seconds in the manual or 8.0 seconds with the Dualogic automatic transmission. The top speed possible in the Abarth 565C is 210 km/h, which is more than fast enough for anybody to have fun with. When the top’s down and you’re going just at the legal road limit, it’s enough to ruffle your hair just a bit… and that’s what a convertible is all about. Although the bells and whistles have been pared back to the minimum, the same isn’t true of the passive safety features in the Abarth 565C. Airbags have been provided for the driver, driver’s knee, passenger, side curtain and head side, and the front seats have pretensioned force-limited seat belts with fastening sensors… just what you need in stylish sports seats! Although the Abarth 565C isn’t really intended to be your typical family vehicle, it nevertheless has ISOFIX child seat preparation in the rear seats. If you’re ready for plenty of fun and to feel the wind in your hair, then the Abarth 565C is the car that’s going to make you grin. For any more information on the Abarth 595C, or for that matter any other new car, contact one of our friendly consultants on 1300 303 181. If you’d like some fleet discount pricing (yes even for private buyers! ), we can submit vehicle quotes requests out to our national network of Abarth dealers and come back with pricing within 24 hours. Private Fleet – car buying made easy!